I decided to start making a short guide based on my experience to be used to all beginner fly tiers. There is a lot of info on web also in books and I’m sure that is nothing new in these articles. probably good photos and better explanations based on my experience will help others to learn faster than I did :). Tails have the role to provide the right balance of the fly and also the insect print or also called silhouette of the fly. If the fly is a spinner, or a dun the tail will have different positions. Usually this is not so important but are moments when fish are so shy and suspicious and if the fly is not perfect made will refuse it. 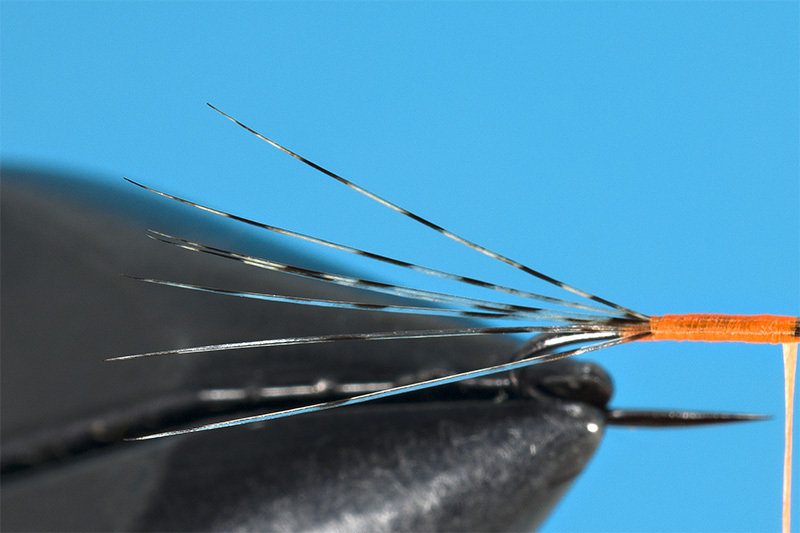 For classic dry flies the tail is made from different materials that float or have a neutral density. 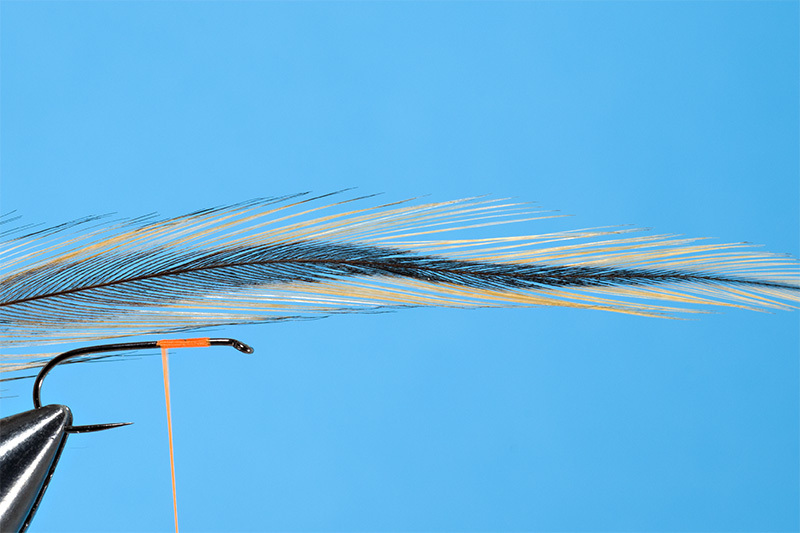 Hair from deer, hair fibers from nutria or castor are used but the most used materials are the barbs from rooster feathers. 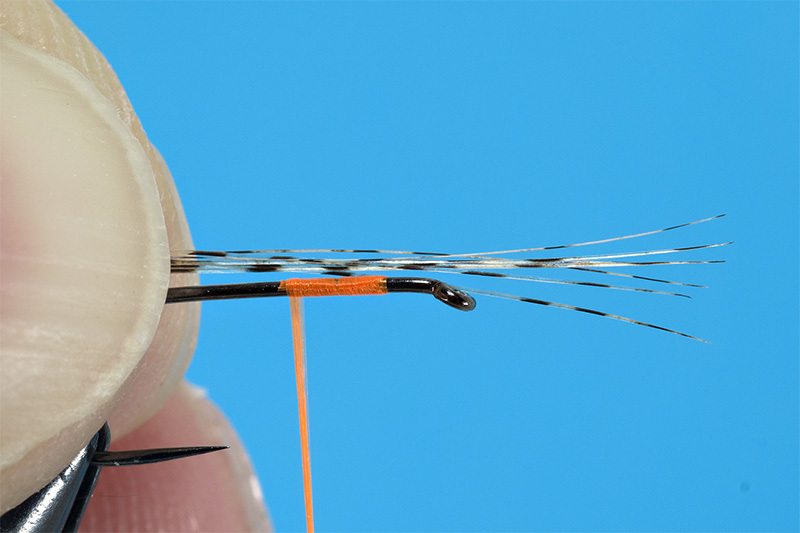 Unfortunately those from hen are not good for dry flies because the barbs soak water due the characteristic structure. You can see bellow how the hen barbs are stick together. They behave like this because the barbs are soft and have a kind of small hooks that will make the them to remain “glued”. Conclusion: barbs absorb water and will not help the fly to float. Other feathers with the same structure are: european common partridge, french partridge, jey, some feathers from ducks. 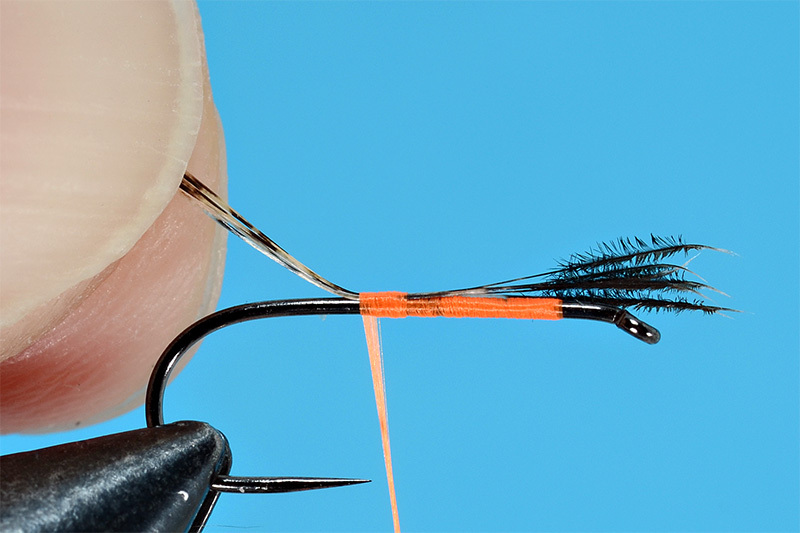 So if you will see dry flies tied with partridge barbs as tails , probably will look nice but will not float . 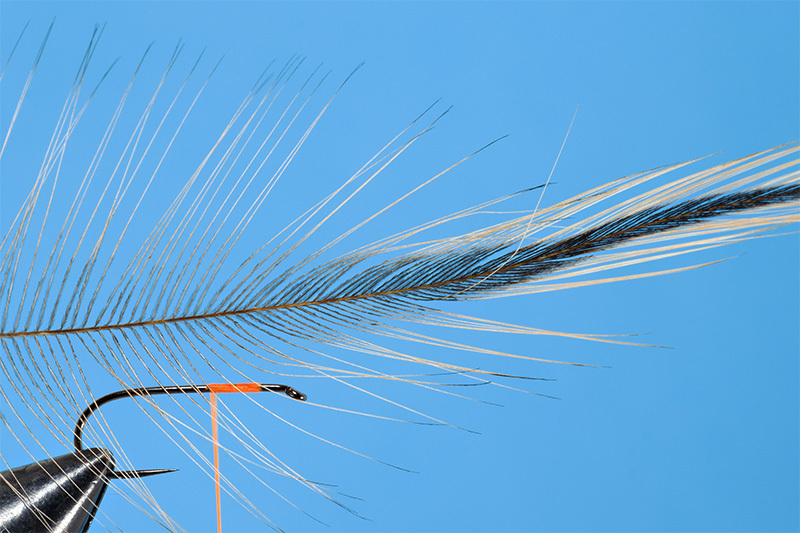 Those called small hooks from the barbs are very closed to the stem of the feather. Then the barb is nice and shiny without anything else attached. The zone where the barbs have those small “hooks” is called also soft area or soft core area. All the time you should use barbs nice and shiny and as much as possible without soft core part. I prefer to use barbs from Spanish Coq de Leon Pardo or Coq de Leon Indio because these barbs are special, beautiful colored, translucent and are shiny with an interesting glow exactly like tails of natural insects. more than that are more resistant , elastic and without matte color zones like in the situation of the classic rooster (Indian rooster or other European classic rooster raised for meat). For example if you take a feather from an indian cape you will notice that one part is shinny and one part is matte. You should mix the barbs to have an homogenous tail. 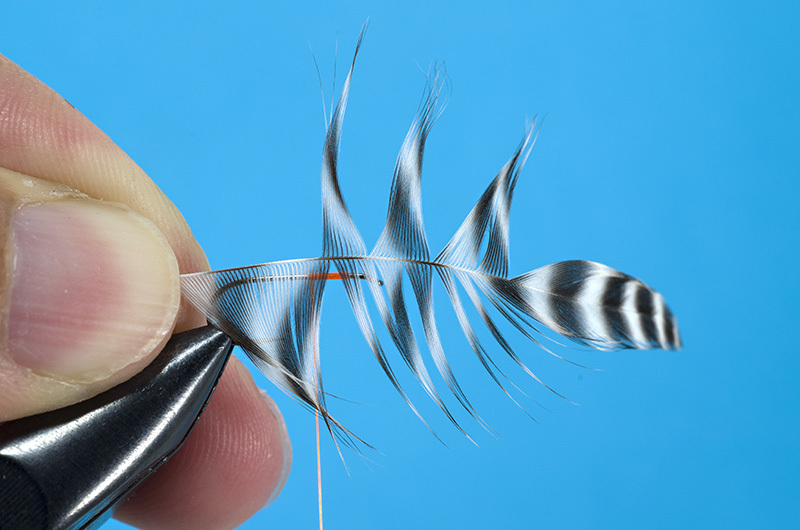 Instead if you use barbs from Spanish rooster the color of the feather will remain the same for both sides of the feather. Before fixing the barbs is good to know that too many barbs will make the fish to refuse the fly. Also if are not enough the fly will not float for a long period of time. For this reason is better to use longer barbs instead to have a shorter tail but thicker. Bellow I use 6 barbs for a size #12 and I like to have the tail 2 times longer than the hook shank. If are too long also the fish will detect that the insect is artificial and will spit it. Especially the grayling will do that. For example our old local fisherman prefer to tie the flies for grayling without tail and with hackle tied collar. 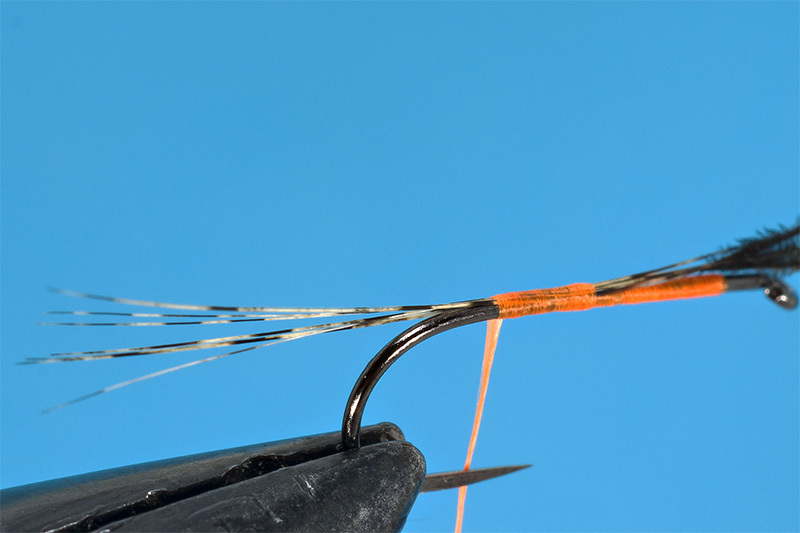 Anyway is tho way to measure the tail fast and easy : using the hook shank as reference or the gap of the hook. 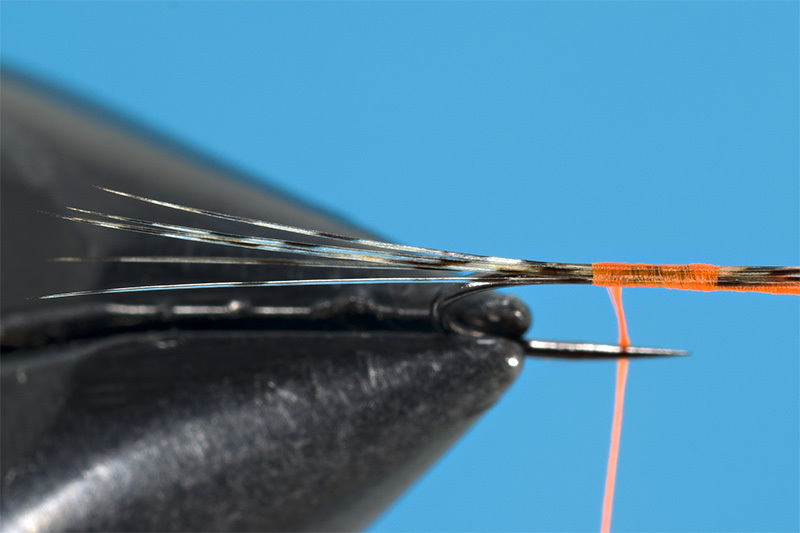 To have uniform tails for your flies I recommend to tie the fly on the same hook size and when you are satisfied you should go to the next size. 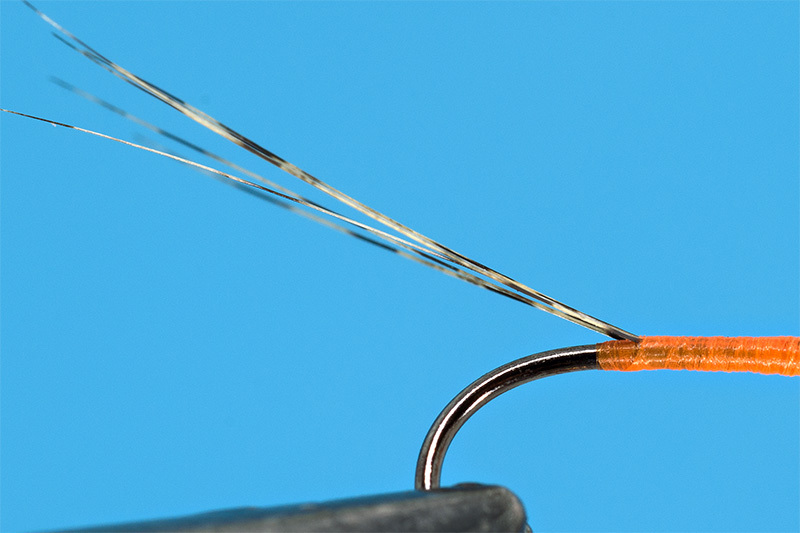 In our fly tying world the length of the tail for a dry fly (ephemera type of imitation) should be between one and half the hook shank length up to 3 times length. Or 2 times gape size up to 4 time gape size. The length size is correlated with the number of the barbs. For a size #12 you can have 6-8 barbs, for a size #14 you can have 4 to 7 barbs, for size #16 3-4 barbs and for size 18 and down you can remain at 3 barbs. 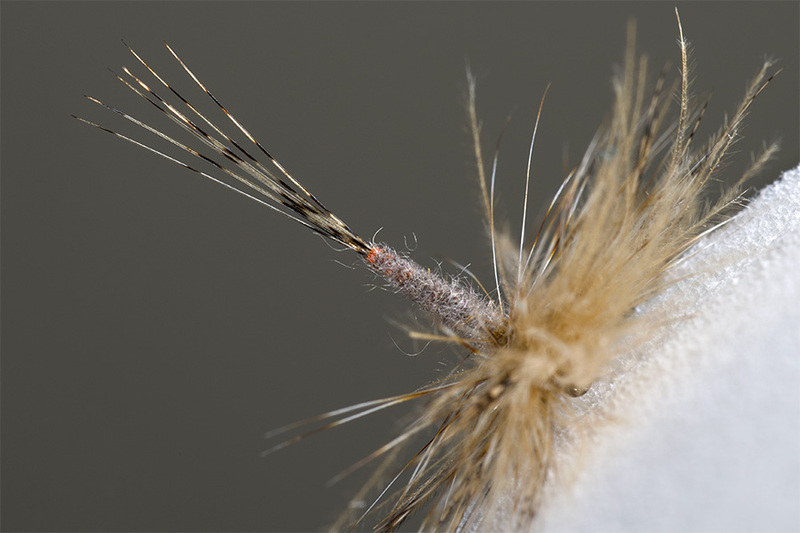 Take in consideration also that if you make a heavy dressed dry fly in hackle than also the tail should be dens. Otherwise the fly will not be well balanced and will not float in the proper manner . When you fix/add materials in tying process is good to know that we must have relaxed hands . For this is better to have all the time the left hand ( in this case ) all the time supported by vice like in the photo bellow. 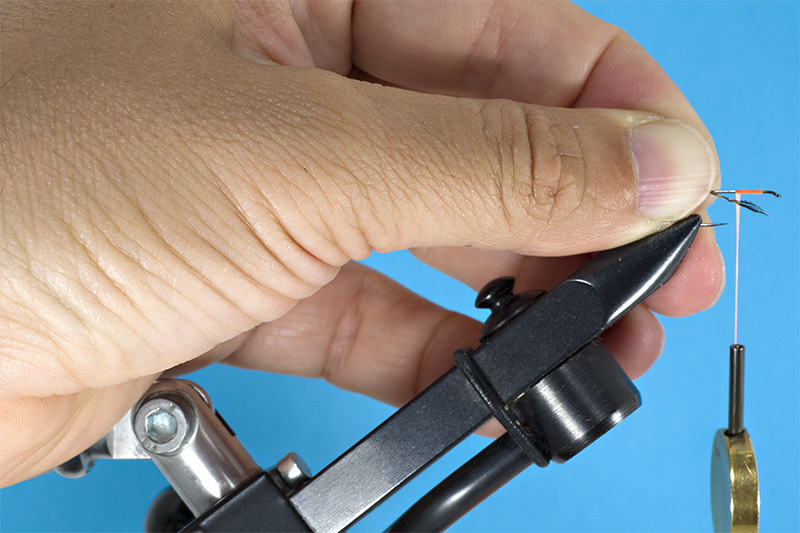 In this way you can tie flies without having tired hand. 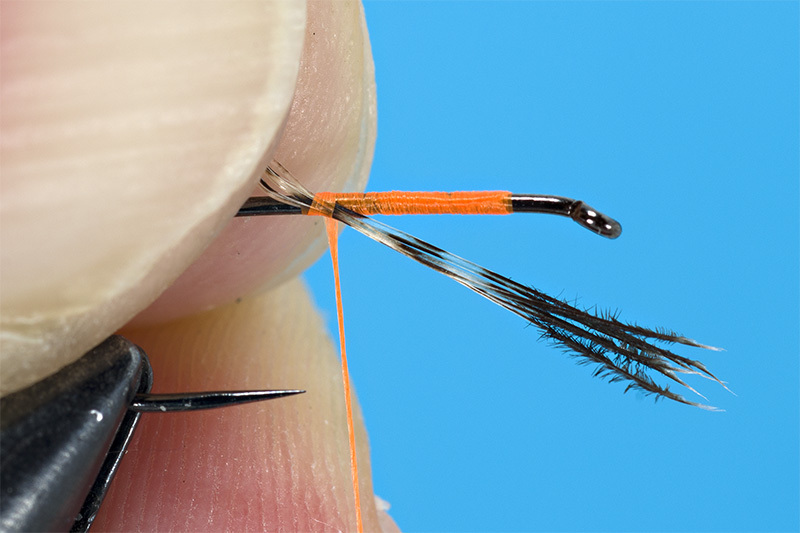 A tired hand will increase the tying time ( shaking, imprecision in adding tail fibers – for example, etc ) and the fly will not be so nice and homogeneous. So for this reason is very important to buy/use a vice that is ergonomic for tying process and not only beautiful. 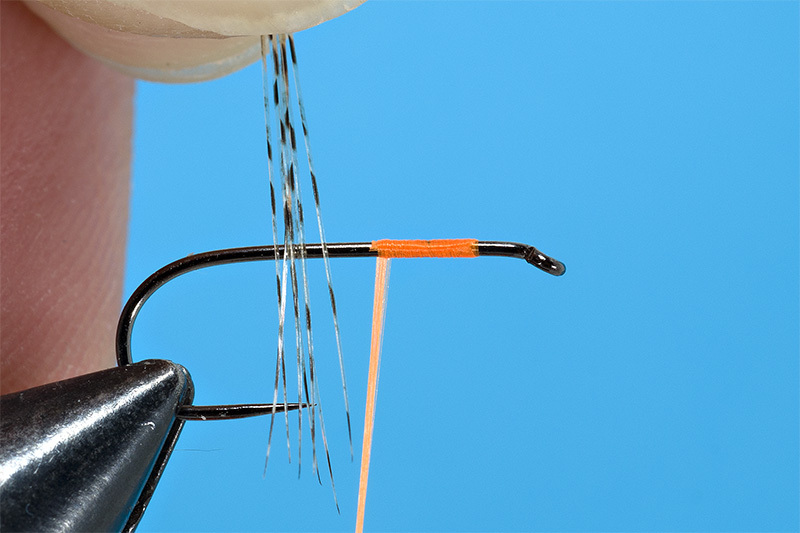 Should be a tool that will help you to tie faster and better. Now you will have a nice well fixed tail. Probably not all pay attention at this details but a wrong fixed tail means an improper floating of the fly on the water. Please don’t forget to keep the under body made of thread as slim as possible and do not overload it. Don’t forget that an adult stage of insect have a nice and slim body with a clear and sharp body. 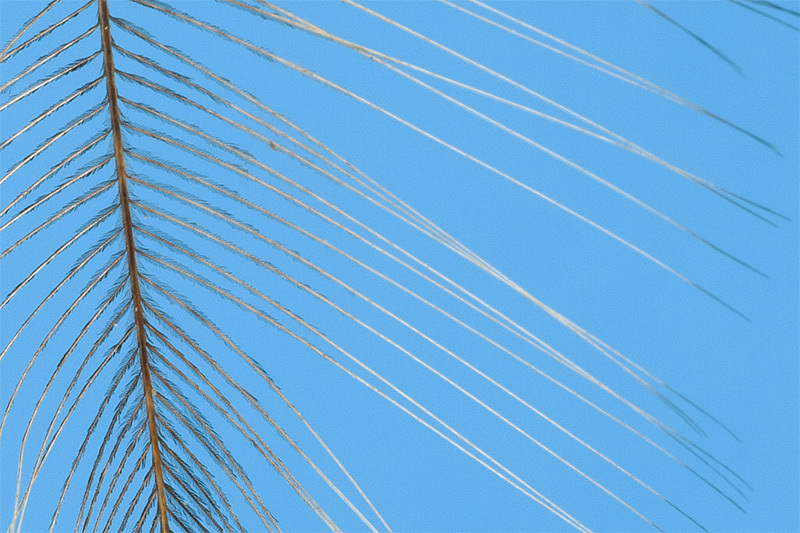 The insect is delicate, everything is well balanced so try to stay closer to the natural look. Great tips Lucian, thanks for posting. Excellent article, thanks for taking the time to put it online! thanks guys, you are very kind :). Thanks for terrific post and great instructions. I also use CdeL which I purchase from a great source in Spain. The same material purchased in the UK ,from my experience, is poor quality and vey high price. Even after many years of fly tying , I still struggle trying to set the tails . 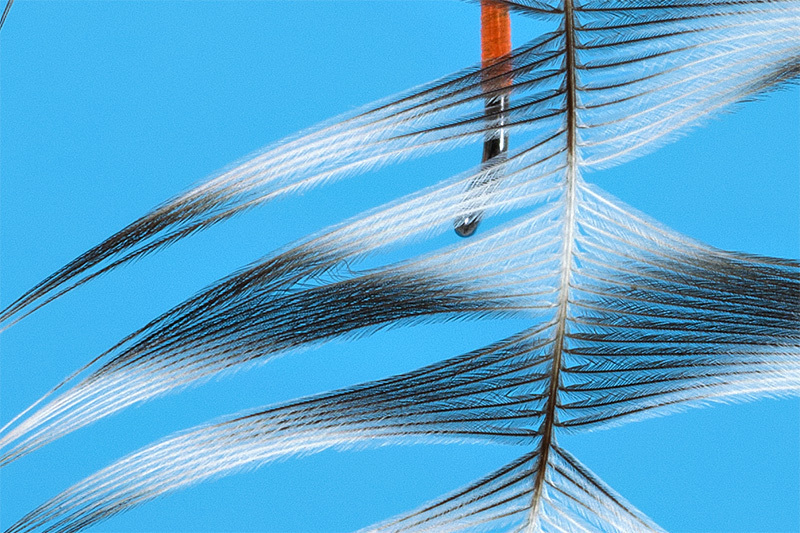 I find that when wet the tail fibres tend to come together into a single strand. I end up trying to do a figure of eight to keep them splayed but I’m never really happy with the results. Again thanks for a great set of helpful instructions. Yes, agree, in Spain you’ll find a few good sellers of Leon feathers! If you like make a few experiments, put a fly on the water in a large glass with water to see how the fly will stay. 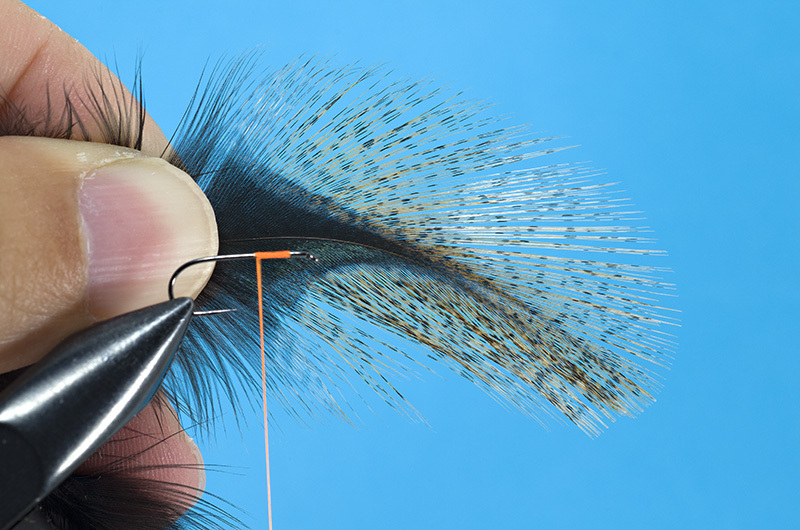 Make a few flies based on the same model: with longer tail, with shorter tail, with spread tail, with poor hackle, with dense hackle, etc. Then make a comparison between them. Ok is a geek type of test but is fun and you will notice a lot of interesting things . If you want to complicate, use floating solution on the flies. Thank you Lucian! This is so very helpful, i’m really glad i know this blog.